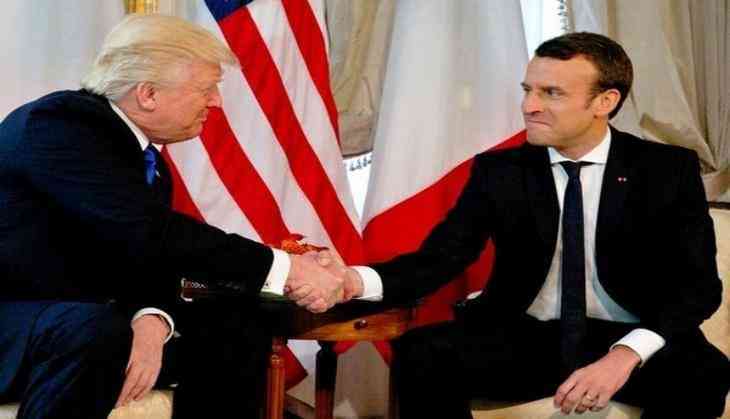 With US President Donald Trump's signature handshake managing to make highlights almost every time, the newly elected French President Emmanuel Macron described his recent encounter with him as 'the moment of truth'. "My handshake with him - it wasn't innocent. It's not the be-all and the end-all of a policy, but it was a moment of truth," said Macron, as reported by the Guardian. Trump and Macron's handshake was white-knuckle prolonged one, with as usual fierce, crunched bones, tightened jaws and both had a fixed smile and as per the French President is was entirely intentional. As per reports, during the handshake both the leaders were shared a gaze a little longer than a moment, and was ended when Trump after two attempts were able to disengage himself. Macron further stated that he doesn't see relationships in terms of a balance of power, neither believe in diplomacy by public abuse.
" Donald Trump, the Turkish president or the Russian president see relationships in terms of a balance of power. That doesn't bother me. I don't believe in diplomacy by public abuse, but in my bilateral dialogues I won't let anything pass," Macron said. The French president recently elected for the very first time after defeating far-right leader Marine Le Pen. In his three-day visit in Brussels, Macron and Trump met for the first time for lunch before a gathering of European and Nato leaders last 25 may. During this meet, Macron pointedly turned past Trump to embrace German chancellor Angela Merkel and later shook hand with the NATO secretary general, Jens Stoltenberg, and Belgian Prime Minister, Charles Michel, before greeting the US President. Trump responded by yanking the French President's hand hard towards, which he has been seen applying in the past, notably with the Japanese Prime Minister, Shinzo Abe possible to establish dominance. According to reports Macron was particularly outspoken, but was not very successful in urging Trump to announce at the G7 that he would not to pull the US out of the Paris climate change accords. "I have good hopes that having considered the arguments put forward by various people and his country's own interest he will confirm his commitment in his own time. I saw someone who listens and who is willing to work," Macron said.